UNIVERSE UNIQUE LED Animated Projector with Amazing Changeable Motifs： with dynamically changing images, more creative and more particular. 14 seasonal themes with exclusive and interchangeable motifs(with 2 for stochastic surprise), including 56 different displays, 4 images compose 1 amusing animation. totobay 2018 holiday projector cover all the occasions of festival series and life series. MORE CLARITY Holiday Projector Light: interchangeable images colorful projection animation instead of black or white images. 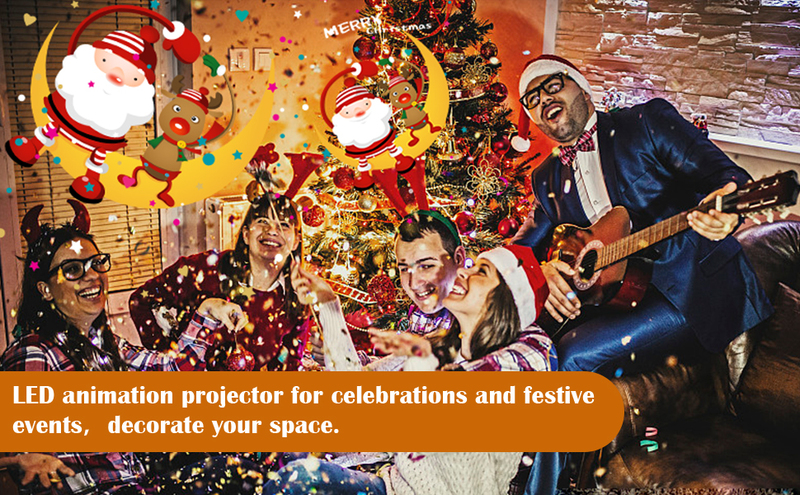 The projector can be used in the garden, swimming pools, bars, clubs, weddings, family celebrations, kid’s rooms, on your path or in your courtyard, for Christmas, for Easter, for Halloween, for Thanksgiving, on birthdays, or for all other festivals and daily life events. IP65 Waterproof & 6H timer：the projector is waterproof and meets IP65 standard. Thus it can be used in the rain or snow. It’s ideal for outdoor use in all weather conditions（Attention: the heat sink can no be steeped in the water.）. More over, the machine comes with 6 hours automatic shutdown function, that is, work for 6 hours and then shut down automatically. More convenient and there’s no use to turn off the projector in the night. ONE BUTTON WITH EASY OPERATION: just one button is provide to turn the projector on/off and lighting modes. And also you can adjust the speed of the animation and displaying image. It gives you the latitude to create the effects you like. EASY TO INSTALL: the projector comes a base and stake, you can choose to install it in the grass with the stake. With the stake removed, it can also be mounted to a structure using a sturdy hanging clamp and safe cable. Place projector approximately 10-15 feet from the projector surface, and after the light is turn down you may need to adjust the distance to get the best results. 1.Press the button to turn on the projector light, starts with rotate anime projection. 2.Press the second time, the pattern rotates fast. 3.Press the third time, hold one image static. 4.Press the next 3 times, images will be displayed one by one. 5.Finally press to shut down. The machine comes with 6 hours automatic shutdown function, that is, work for 6 hours and then shut down automatically. 1. To avoid any accident, never put this product in fire. 2. If there is any malfunction, please unplug the unit for 3 seconds. 3. The product is waterproof, but please avoid the adapter close to water. 4. The power requirements of this product is 100-240V/50-60HZ, once beyond this range, please use the regulator device, otherwise it will affect its service life.